Galileo Galilei (Pisa, 1564, Florence 1642) was the greatest Renaissance scientist in the Grand Duchy of Tuscany. His activity was promoted by the Medici family and opposed by the Catholic church. Galileo Galilei discoveries were the reason why the scientist was processed and condemned. He lived an incredibly entertaining life, filled with questions and answers that nobody but Galileo could conjure up. Albert Einstein was the person who claimed that he was the father of modern science, so that just goes to show you how much respect you should have for this man. Galileo Galilei discoveries ultimately lead to the optimized-categorization of four moons (all of which are large, by the way). These moons would be Io, Ganymede, Callisto and Europa. These four moons are known as the “Galilean moons”, and they continue to keep his legacy alive to this day. The very first spacecraft that actually entered orbit around Jupiter was named “Galileo” as well, which was a nice little touch added into the mix. Galileo is also the forefather of assuming the moon’s surface was rough, as opposed to smooth (or even made out of cheese). Galileo observed the planet of Neptune during the year 1612, and he even refers to it as a “dim star” within found writings. When Galileo had looked at Saturn for the first time, he thought that the rings were actually alternate planets; this led him to believe that it was a 3-planet system. He went to take a look at the planet later on and noticed that the rings had moved and were “pointed” towards the earth, so it seemed as if two of the bodies had vanished into space. The rings came back when he looked at the planet a second time in 1616, garnering even more confusion from a disgruntled Galileo. Venus is another planet that Galileo “discovered”, and he noted that the planet practiced the same sort of processes our Moon does. Among Galileo Galilei discoveries, he was the first person to claim that there are an incomprehensible amount of stars that the naked eye can’t see, something that we know is true in modern times. He dabbled in the physics of falling bodies through the process of dropping balls, and he even had skills in the engineering field as well; he actually created a thermometer during the year 1593, he only used a light bulb and a tube to do it. Sunspots were initially figured out by Galileo as well, even though Kepler had taken note of one (without intentionally doing so, mind you) back in the year of 1607. The Catholic church processed the scientist in 1633. 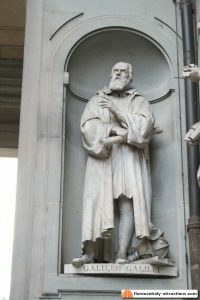 It was not for Galileo Galilei discoveries, but because he supported Copernicanism, negating the Aristothelic universe where Earth was static in the center. Galileo was condemned and forced to forswear his opinions. He was also forced to stay in his house at Arcetri, in the hills of Florence, without receiving anybody but his relatives (who had to receive authorization, by the way). At his death in 1642, the church refused to host his body in consecrated land; thanks to the Medici family, he was buried in secret in the Medici chapel of the Basilica di Santa Croce. 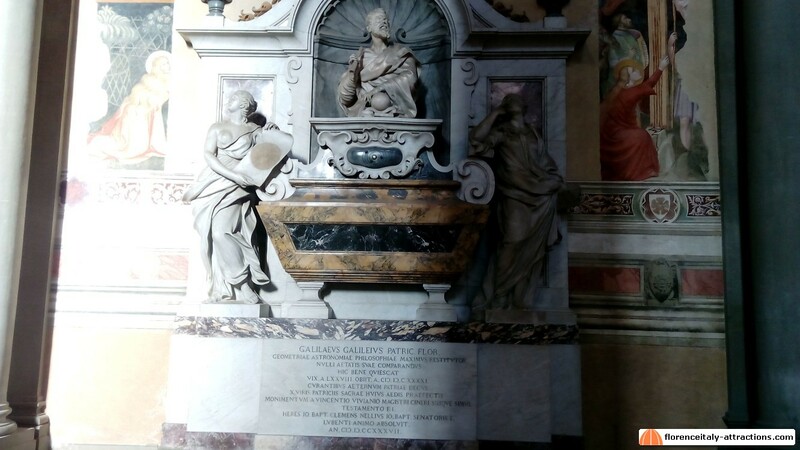 One century later, the last Medici Grand Duke Gian Gastone decided that enough was enough and he ordered that a beautiful monumental tomb be built in the same Basilica, to finally celebrate the great scientist. In 1981, Pope John Paul II created a commission to review the trial, and in 1992, the same Pope admitted that the Catholic church made a mistake in condemning Galileo.